Our rustic Amish Made Reclaimed Wood Furniture Mortised Flat Backless Bench is made from thick planks of tobacco barns boards, giving each bench a unique charm. 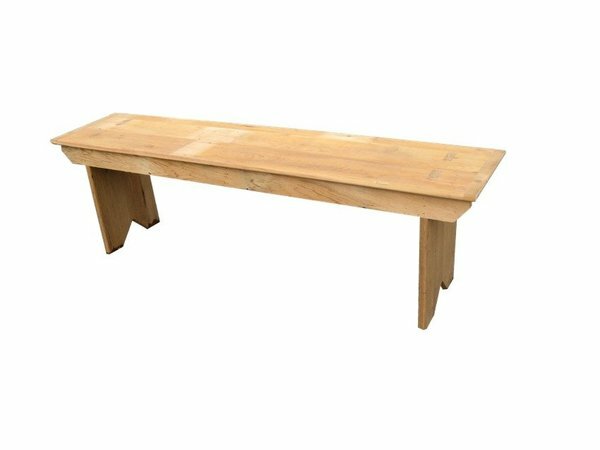 The Amish handcrafted Reclaimed Wood Furniture Mortised Flat Backless Bench is crafted from salvaged thick planks of old tobacco barn boards that are naturally weathered and distressed. There will be grooves and saw marks and sometimes even nail holes which can be filled upon request. The wood is then finished in a hand process that has over 10 steps that bring out the distinctive character and look of the natural old wood. The Amish Made Reclaimed Wood Furniture Mortised Flat Backless Bench is handcrafted from old pine wood planks, to create a rustic, unique look. The solid wood bench come in varying sizes. This is an extremely well-crafted plank bench and is very durable! Finish choice ONLY available on the legs and skirt. The bench top is finished with a stain to match the old wood finish and 5-10 coats of a matte poly-finish are applied for years use. Old wood has a distinctive charm in its look. There will imperfections in the old wood which just adds to the uniqueness of it. Each marking on the wood tells a story of where the wood has been. These screw holes, gouges and indentations add to the rustic charms of this bench. The old wood may have existing screws and screw holes, paint in grain and/or pine knots, and/or hairline cracks in the planks. These add to the rustic, farm look of the bench. This is a very durable strong bench. Since this plank bench is made using old, antique planks it needs 5-10 coats of a matte poly varnish to achieve a smooth, even finish. The first 3 coats just soak right into the wood. Then the additional ones are needed to get a nice smooth even finish. Most of the wood comes from tobacco barns. Different types of oil and even smoke can be absorbed into the wood from curing the tobacco over the years. What the wood has absorbed over its life influences how much poly needs to be applied. The finish will not have a thick appearance even with so many coats, which adds to the unique charm of each bench! An additional benefit that comes with our plank bench is that because it is made from refurbished wood, rather than virgin forests, it is an ecological choice! The bench legs and skirt can be finished in numerous paint choices. Paint samples are available for you to see before making your decision. Our Amish Made Reclaimed Wood Furniture Mortised Flat Backless Bench is proudly handcrafted in the USA using 100% salvaged hardwood! Finish choice ONLY available on legs and skirt. Bench top finish depend on the finish that is already on the old wood.